When thinking about the biggest influences in the games industry, you’d be forgiven for thinking it was Sony, Microsoft or Nintendo. However, in a survey for the London Games Conference, which is taking place on November 10, Apple turned out to be the industry’s biggest influencer, according to 1000 people working within the industry itself. In addition to this, Apple’s visionary, the late Steve Jobs, was voted most influential person in the poll, taking 26% of the overall vote and 46% top five votes. The nearest person to Jobs is Gabe Newell, who took 16% of the overall vote. “In just over three years the iPhone and the App Store have transformed what consumers expect of games, and how the industry makes and sells them – today, download games have come to the fore. 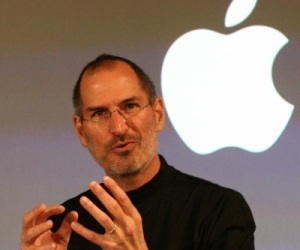 Steve Jobs, the iPhone’s driving force, was the ultimate independent developer – uncompromising in his vision, with unquestionable influence, and hugely artistic and commercial results,” MCV editor in chief, Michael French, said. “Apple thrived by linking ultra-desirable mobile devices to compelling online services. Likewise, the web and connected services like Facebook and Steam have transformed how humans behave and interact, so it’s little wonder to see all of these products and their progenitors Tim Berners-Lee, Gabe Newell and Mark Zuckerberg rank highly in our London Games Conference survey.” French continued. It wasn’t always mind-bending success for Apple, it did release a console in partnership with Bandai, the Apple Bandai Pippin, back in 1995, which swiftly became history – proving that we all make mistakes along the way. It is hard to ignore or deny Apple’s influence in entertainment in general as its iOS devices continue to sell in their millions and with it, sell millions of games. Angry Birds, for instance, is nothing short of iconic the world over, and it’s only a couple of years old. What do you think about Apple’s role in the video games industry? Let us know in the comments below.